Gouty arthritis. However, calcium pyrophosphate dehydrate deposition disease (CPPD) and rheumatoid arthritis are the differential diagnoses, which need to be evaluated both clinico-radiologically and with a histopathological examination. 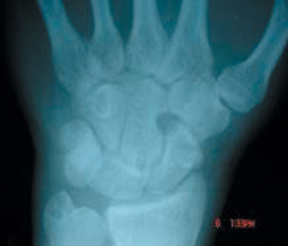 There were multiple small nodules and a large nodule on the dorsum of left hand at the base of 3rd metacarpal (Figure 1), a localized cystic granuloma in the retrocalcaneal region is shown, and multiple tophaceous deposits over the 1st metatarsophalangeal joint and hallux valgus deformity are seen. The radiograph (Figure 2) shows a ‘Scalloping sign’ in capitate and a punched-out lytic lesion involving the scaphoid, capitate, and trapezoid bones. The radiograph provides (Figure 3) anteroposterior views of both feet demonstrating punched-out lytic lesions in the 1st metatarso-phalangeal joints with marginal erosions in the metatarsal head. 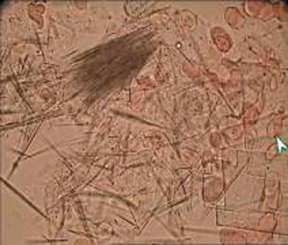 Aspirate of hand and retrocalcaneal region shows needle shaped urate crystals (Figure 4). 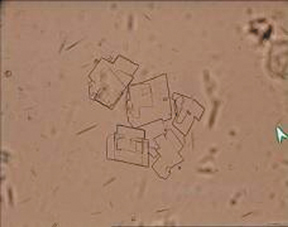 The image shows needle shaped Monosodium urate crystals and flat, plate like colorless uric acid crystals with numerous RBC’s. No pus cells were seen. 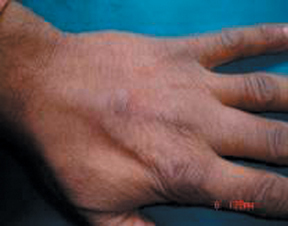 Gouty tenosynovitis in the hand can be present without tophi or previous involvement of upper extremity.3 Often called “the imitator,” gout may masquerade as septic arthritis, rheumatoid arthritis or neoplasm, and the diagnosis is often delayed by weeks or months. Gout can rarely coexist with rheumatoid arthritis,8 but it is perhaps more frequently misdiagnosed as rheumatoid arthritis because of its proliferative synovitis3 and because 10% to 20% of patients with rheumatoid arthritis have elevated uric acid levels. Our patient who was on long duration of treatment for gouty arthritis presented to our clinic with nonspecific knee pain and an incidental radiological evaluation of left hand showed the involvement of carpal bones. The literature on gout is huge and refers, not specifically, to every joint. The fact that the carpus has not been extensively described constituted a base for our presentation. Histological examination demonstrated urate crystals from the aspirate of hand and retrocalcaneal region and confirmed the carpal involvement. Gouty arthritis can also occur in carpal bones. It can occur alone or along with or without the associated findings. One should always have a high index of suspicion. Systematic, good clinical examination and proper radiographs should be carried out. Histology confirms the diagnosis. Carpal involvement in gouty arthritis should also be kept in the differential diagnosis in any case of unusual lytic lesions in carpal bones. 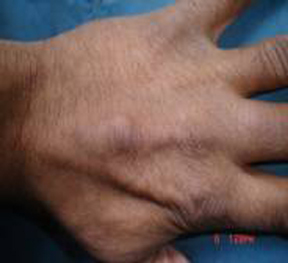 Gouty arthritis has various presentations in the hand. They include acute tenosynovitis, carpal tunnel syndrome, tophi deposition in the palm, punched-out lytic lesions; and involvement of the metacarpals. Carpal bones are rarely involved. This case showed the involvement of carpal bone. One should be careful in interpreting hand radiographs. A systematic clinical examination along with radiographs and aspiration cytology confirms the diagnosis. Moore JR, Weiland AJ. Gouty tenosynovitis in the hand. J Hand Surg [Am]. 1985;10:291-295. 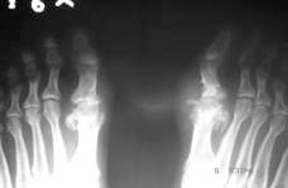 Barthelemy CR, Nakayama DA, Carrera GF, et al: Gouty arthritis: A prospective radiographic evaluation of sixty patients. Skeletol Radiol.1984;11:1-8. Abrahamsson SO. Gouty tenosynovitis simulating an infection: A case report. Acta Orthop Scand. 1987;58:282-283. Janssen T, Rayan GM. Gouty tenosynovitis and compression neuropathy of the median nerve. Clin Orthop Mar. 1987;216:203-206. Zayas VM, Calimano MT, Acosta AR, et al. Gout: The radiology and clinical manifestations. Appl Radiol. 2001;30:15-23. Uri DS, Dalinka MK. Crystal disease. Radiol Clin North Am.1996;34:359-364. Becker MA. Clinical aspects of monosodium urate monohydrate crystal deposition disease (gout). Rheum Dis Clin North Am. 1988;14:377-394. Atdjian M, Fernandez-Madrid F. Coexistence of chronic tophaceous gout and rheumatoid arthritis. J Rheumatol. 1981;8:989-992. Lagier R, Boivin G, Gerster JC. Carpal tunnel syndrome associated with mixed calcium pyrophosphate dihydrate and apatite crystal deposition in tendon synovial sheath. Arthritis Rheum. 1984;27:1190-1195.